Politics and religion used to be considered taboo when it came to acceptable topics of conversation on the job. But that’s starting to change, and some employers aren’t shying away from talking politics at work. “Politics is just as important to your day-to-day activities and it’s important to us as a company and citizens. Why would you take that off the table?,” asked Manny Medina, CEO of software company Outreach, based in Seattle. Some companies are welcoming civic engagement in the workplace, and inviting their employees to get more involved. Medina gave Election Day off to his roughly 300 workers. “I wanted people to take the day off for themselves and their families to vote and talk to each other and the neighbors about the political views,” he said. Employees who still wanted to come into the office had lunch together and held small group discussions. 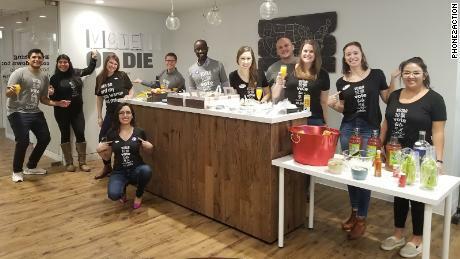 Employees at Phone2Action, a software company for advocacy campaigns located right outside Washington, DC, were greeted with Bloody Marys, mimosas and breakfast on Tuesday. The TVs in the lobby remained tuned to Election Day coverage. They also got a breakfast Wednesday morning to digest the results. Phone2Action employees from both sides of the aisle sat and watched the confirmation hearings for Supreme Court Justice Brett Kavanaugh in the office together in September. “It was great to see everyone watching it,” said Hartsock. She expects political talk in the office to become more common. But increased political discussions can be challenging for employers and employees trying to maintain an environment where workers feel safe and productive. Following a few simple guidelines can help workers navigate the heated topic, while maintaining professionalism and respect for coworkers. If you want to discuss politics in the office and work in the private sector, the First Amendment won’t protect you. “The right to talk politics at work is not guaranteed by the Constitution,” said Jay Zweig, an employment lawyer at Bryan, Cave, Leighton, Paisner. Companies can ban political speech in the office — within certain limits. If a worker is talking about the terms and conditions of employment (like wages and workplace improvement and conditions) that is protected under the National Labor Relations Act. There are also state laws that protect workers against retaliation or intimidation related to their political beliefs, according to Zweig. Employers should create policies around political speech in the office that focus on being respectful and prohibit harassment, discrimination and retaliation, Zweig recommended. The terms of these policies should also be straightforward and clear and all employees should be made aware of them, recommended Tom Spiggle, an employment lawyer at The Spiggle Law Firm. “It should be a well spelled-out policy that they enforce evenly,” he said. Workplace conflicts or a difference of opinions can have repercussions in the workplace beyond disagreements. The fallout can be more subtle, like not being asked to join a team project. “If political tensions have come up and you have different views, they might not want to work with you 10 hours a day,” said Hannon. Even if you wholeheartedly disagree with a coworker’s political stance, be respectful. If you walk into the kitchen and find yourself in the middle of a political exchange you want nothing to do with, be ready with a natural way to sidestep. Claiming to have a meeting or be on deadline can also help you exit quickly. How you spend your time out of the office can also affect your employment. “The employer can say the activities or views are not consistent with our company core values,” said Zweig. However, some states have passed laws that protect workers from getting fired for outside work activities. When passions are running high, people tend to be less cautious with their speech when they’re posting on social media or typing. “People will type things or tweet things that they wouldn’t say in person,” said Zweig, and a social media posting can lead to termination.